I must admit I was a little disappointed with the Newspeak: British Art Now (Part 1) exhibition at the Saatchi Gallery, there was certainly some quality work, but overall it lacked the impact of the Sensation exhibitition at the Royal Academy in 1997. One of the artists that did catch my eye was 47 year old Cornwall based painter, Ged Quinn. Several of Quinn’s large landscapes and still lives shared a room with Sigrid Holmwood’s pastich fluorescent paintings of early Van Gogh. 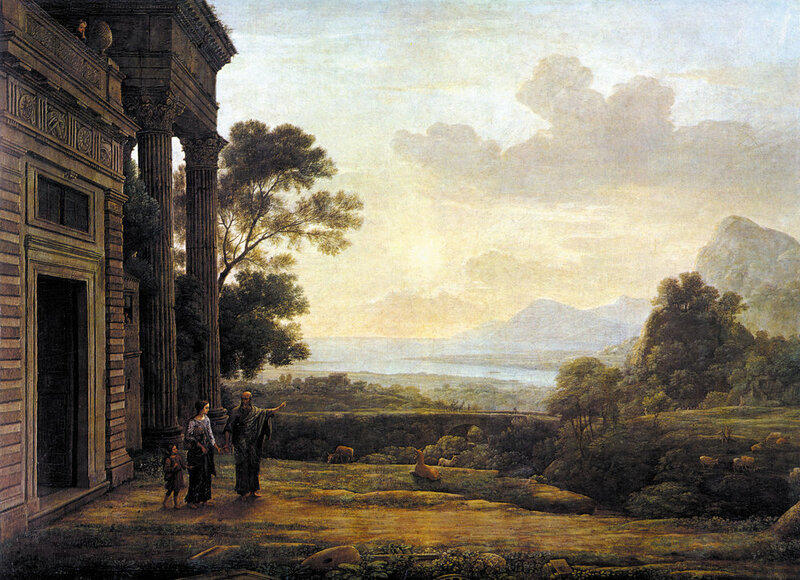 Quinn draws on an even earlier source of inspiration, the feathered landscapes of Claude Lorrain. “The Fall” is based on the Claude’s Arcadian setting for his 1668 painting “The Expulsion of Hagar” to which Quinn has added poet and dramatist Antonin Arnaud falling from the sky towards a ramshackle burnt out shed. The painting is clearly layed with meaning and the references from recent history becomes “blots” on the Romantic styled landscape. The shot down Antonin Artaud, the creator of the Theatre of Cruelty, is swathed in combat-plane camouflage refers to Lucifer's fall from grace in Milton's Paradise Lost. The shed is Thomas Edison's first purpose-built film production studio, the “Black Maria”, and it is decorated with Artaud's work. I must admit to a weakness to spending time trying to work out the references in his paintings rather than trying to decipher what the whole might mean. In the Theatre of Cruelty, Artaud was trying to revolutionise theatre - figuratively burn it to the ground so that it could start again. He was trying to connect people with something more primal, honest and true within themselves that had been lost for most people. He believed that text had been a tyrant over meaning, and advocated, instead, for a theatre made up of a unique language that lay halfway between thought and gesture. This has interesting parallels with the theory surrounding the death of painting and provides us with the link to the film industry, where everything is false. Artaud believed in physical expression, something lacking in Claude’s “old fashioned” picturesque landscape painting. It is typical of the mediated vision of the ideal landscape that we all have in our mind's eye and is no longer radical, any power it once had has been bled away by mechanical reproduction. A knowledge of the subject of the original Claude painting may provide a different interpretation, it shows Hagar and Ishmael being banished into the desert of Beersheba by Abraham. The original is set in the cool light of morning and is paired by a second painting (a pendant) set in an evening desert landscape when the archangel Michael appears to the sorry couple and leads them to a well, saving them from dying of thirst. In Quinn’s painting centuries have passed, Hagar and Ishmael long gone, the temple derelict and fragments of columns and pediments lying in the foreground, but the cool light of dawn remains. Is this the truth that Quinn wants to represent in his “Theatre of Cruelty”? Unfortunately the recent exhibition of van Gogh’s letters, drawings and paintings proved to be so popular that it was difficult to even stand still in the press of the crowds in the Royal Academy. However, there were a lot of fine paintings on display and it was especially interesting to see them accompanied by his descriptive letters. I had gone with the intention of reviewing his portrait of the stoic and melancholic looking Madame Ginoux (L’Arlesienne, 1888) but instead I was captivated by a small jewel like version of The Sower painted in the same year. It is a theme he had addressed several times before, originally inspired by the work of Jean-François Millet, a painter who idealised the ‘monumental’ work of French peasants. This version is very much his own though, and shows the influences of Japanese prints on his style. In a letter to his brother Theo from around 21st November of 1888, Van Gogh drew a sketch of the Sower and described the colours he was using “Here’s a croquis of the latest canvas I’m working on, another sower. Immense lemon yellow disc for the sun. Green-yellow sky with pink clouds. The field is violet, the sower and the tree Prussian Blue” . The faceless sower works on the left of a canvas divided by a pollarded willow, a motif that had appeared in a watercolour sketch from 1882. The landscape is schematic and flat, but a strong diagonal leads the eye to the huge yellow ball of the setting sun that almost becomes a halo for the working peasant. The colour is laid on with short definite brush marks with all the energy of someone working hard against the clock. This energetic expressive brushwork not only adds to the vibrancy of the colour in the painting but also serves to dispense with some elements of ‘reality’ in order to highlight others, particularly the sense of twilight. The lavender touches to the fields provide a strong complimentary contrast to the sun making it jump forwards. But despite the strength of the yellow, there is a darkness to the image, as both the foreground subjects, the sower and the tree, appear as dark silhouettes. It is this combination of denial of detail and unusual colour choices, such as the lime green skies casting a sickly pallor over his homestead on the horizon that perhaps reveal a hidden truth about van Gogh’s version of reality and gives the painting its melancholic feel. This was my first visit to MoMA and I saw so many ‘great’ paintings for the first time that I find it difficult to even remember them all. However, two paintings made such an impression that I will not forget the experience. One was Les Demoiselles D'Avignon by Picasso and the other was this painting by Magritte. I remember being really surprised just how thin the paint was, Matisse uses a very loose scumbling of opaque paint over the canvas allowing the scrubby brush marks to be clearly seen. The result is a very lively surface although the hues are unmixed. Instead he gives striking contrasts between these rhythmically arranged flat planes of colour, that suggest an experimentation with the ideas of cubism. The colour scheme is predominantly sombre greys which combined with the sketchy brush work give the painting an ethereal melancholic air. The painting is of Matisse's son having a piano lesson who gazes at the viewer with one eye, the other is obscured with paint. There is a woman, who might be his teacher watching him from behind. There is a balcony on the open window on the left that looks out onto a triangle of grass, and its wrought iron work echoes the music stand on the piano. Painted in 1916 at the Matisse home outside of Paris, it is a combination of Matisse’s memory of a time when he was made to study the piano as a young boy and his son Pierre starting to learn 6 years earlier (his elder brother volunteered to fight in the First World War in 1916). The 'piano teacher' is actually a figure in a painting who seems to glare down upon the young pupil. It is a schematic rendition of Matisse's Woman on a High Stool that was hung in the apartment unable to be shipped to his Russian collector Schchukin on account of the war. He also painted one of his bronze sculptures in the lower left-hand foreground. This combination of his own works of art with the image of the memory of his own son playing music make an intensely personal and moving painting. I first saw paintings by Sasnal in the "Urgent Painting" exhibition in Paris in 2000 and this one was my favourite. It was a big influence both on how I wanted to paint and my choice of "Backs" as a subject. Since then I have not even been able to see a reproduction of the painting so this was a special day for me. I must admit I was a little disappointed and felt it lacked the impact it had first had. This may have had something to do with the hang - in Paris it was part of a group of his paintings and was hung in a very dynamic way - here it was one of a group of three similar works conventionally hung in a small side room. Able to get much closer here, and deduce how it was painted. Clearly drawn beforehand as the sketch is just visible in parts. Worked back to front, with the figure painted last. Medium thick paint and the brushwork can be seen. Edges are very sharp on the figure and the treatment of the hair is very good. I would say the face was dry before the hair was done. More fuzzy with blending of edges in the background, which gives a good sense of depth. Not frightened of using and showing shorter brushstrokes in difficult area eg between the chin and the shoulder. Never thought of it at the time, nor made the connection since, but this painting is in effect a miniature Alex Katz. 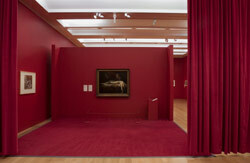 It is also pretty much a one off for Sasnal, most of his work being monochrome and derived from Luc Tuymans' style. Crucially, this brightness of the palette works against the inherent sadness of the image giving us a feeling of anticipation and hope, whereas his usual approach would have changed the mood completely. Another painting in the same group Girl Smoking (Dominika) 2001, Oil on Canvas 33 x 33cm, is much closer to his usual style of painting and the references to Black and White photography are clear. Also the colour scheme seems to reinforce the use of the burning cigarette as a metaphor for transience and slow decay. 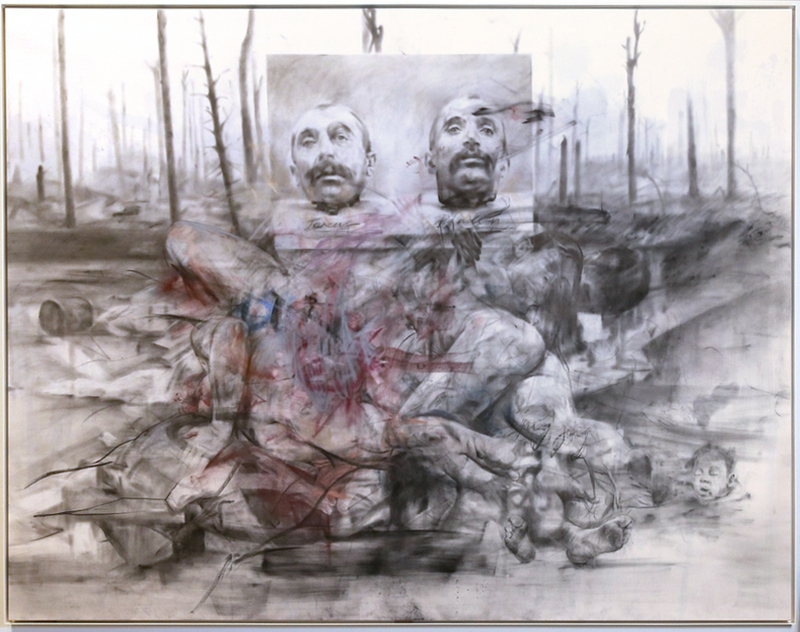 This was the first time I had seen work by this young Romanian painter and it certainly was well suited to the Haunch of Venison’s new home in the old Museum of Mankind in Burlington Gardens, behind the Royal Academy. The show was rather obliquely titled “Darkness for an Hour” referring to the protest about global warming earlier in 2009. As the body of work revolved around two themes; Dada and the custard pie comedy of Laurel and Hardy, I couldn’t see the connection. However, the work made up for it and the paintings were sympathetically hung over four rooms. This allowed the twin themes to develop an interesting dialogue between the seriousness of the works related to Dada and the absurdity of Hollywood slapstick film stars. The painting I have chosen is based upon a surviving documentary photograph of the First International Dada-Fair which was held in the Galerie Buchard, Berlin in summer 1920. This “exhibition” was both the climax of the Berlin Dada movement and its last public event. The organisers exhibited 174 "products" that they proclaimed "Anti-Art" ignoring traditional distinctions between original works and prints, and displayed provocative poster-manifestos on the walls. The large political paintings by Otto Dix, "The War Cripples (45% Employable)" 1920 and George Grosz, "Germany, a Winter’s Tale" 1917 that were subsequently destroyed during the National Socialist period, can be seen on the left and right hand walls respectively. The suspension from the ceiling of a figure with the head of a pig and wearing an officer's uniform was taken as an insult to the honour of the Ministry of Defence of the Weimar Republic and the resulting court case, which could have ended in a death penalty, fortunately only resulted in a small fine. Ghenie’s working process has been to use a large copy of the image and then abstract it by painting over areas, adding in what could be another Dada reference; Joseph Beuys’ coyote from his 1974 action piece “I like America and America likes me”, or maybe a wolf signifying the ghost of the National Socialism that is caught prowling the room biding his time. In the finished painting the last vestiges of the gallery goers have been replaced by a work that definitely wasn’t in the 1920 exhibition, “Black Cross” 1923 by Kazimer Malevich.